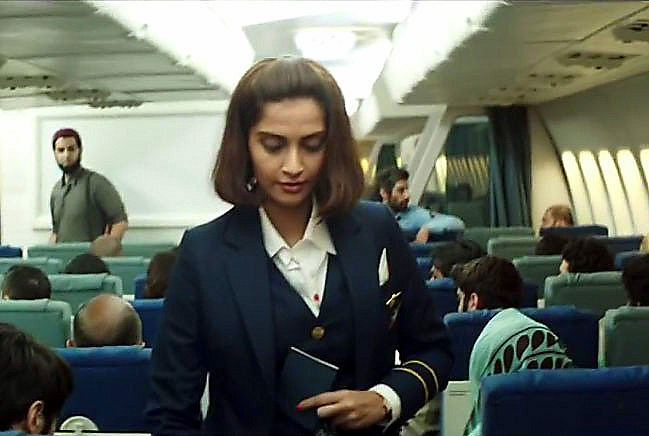 Ram Madhvani directs Sonam Kapoor in Neerja, a story based on the life of PanAm airlines air hostess Neerja Bhanot who risked her own life to save those of her passengers on the Hijacked flight 73 in 1986. As much as Sonam Kapoor would like to think of herself as a massively bankable star she deludes herself that all her blockbusters have been in spite of her and not because of. To have her headline such an important story seemed too risky an endeavour. We are introduced to Rajesh Khanna loving Neerja as she walks into a boring old building society party with kids and middle aged adults and immediately infuses life into the party. This, her mother played by Shabana Azmi, tells us is quintessentially Neerja; the life of the party; her parents’ pride and joy and loved by kids and adults alike. This version of Sonam is believable and likeable unlike previous roles she has essayed. The family cocoon that is created around Neerja is also very believable, the worrying mother, the playfully quarrelling sibling and an adoring father who still regrets having pushed her into an arranged marriage that ended up being abusive. Once on the flight her effervescent personality seems just as genuine, as she looks after unaccompanied minors and puts them at ease. The ill-fated PanAm flight 73 from Mumbai to Frankfurt makes a scheduled stop at Karachi and is hijacked by Palestinian terrorists, Neerja relays the message that the flight has been hijacked while still on the tarmac to the pilots who following protocol evacuate the cockpit leaving the terrorists grounded. What follows is how Neerja tries to do everything in her power to comfort her passengers in a terrifying situation and how she loses her life while trying to protect them. It is an incredible story told in the most respectful of ways. There are no histrionics or hyperbolic heroism just small acts of courage which ultimately were responsible for the 359 lives that were eventually saved. This is almost unlike a Bollywood movie and in a stark contrast to Airlift. There were so many moments when in the hands of a lesser director Sonam Kapoor could have had an outburst at the terrorist or said something sassy just because that is what Bollywood creative license allows, but you see the terror in her eyes and she cries like any person thrust in such a situation would and she tries to refer to the terrorists as Sir and appeal to their kindness to allow her to serve her passengers food and water. By juxtaposing flashbacks to her abusive life with the scenes of absolute terror Ram Madhvani has achieved success twofold. 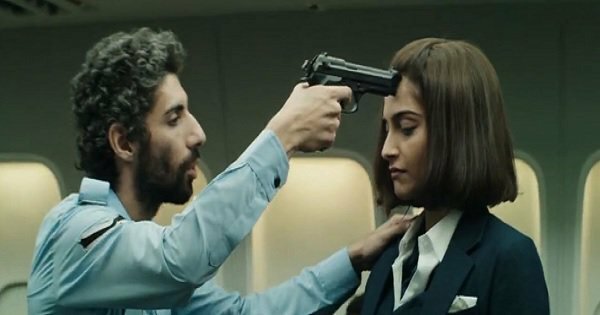 Firstly he gives us context to what prompted Neerja to act with the bravado that she did and also by showing us that an abusive relationship is no less than terrorism. One thing that clearly stuck out to me was the first time that Sonam is attacked by the terrorists the nozzle of the gun bangs against her teeth and upper lip and there is an audible sound. Towards the end of the movie you can see on her upper lip a bruised patch – it is small details like this which shows the audience how committed the cast and crew were to try and honestly retell an incredible story. Sonam Kapoor is a revelation as Neerja Bhanot. She is beautiful no doubt but she is able to carry a sense of frivolity and joyfulness with an absolute ease. While at the same time when faced with a harrowing situation she is suitably terrified yet she manages to find an inner strength to ensure her passengers’ safety. 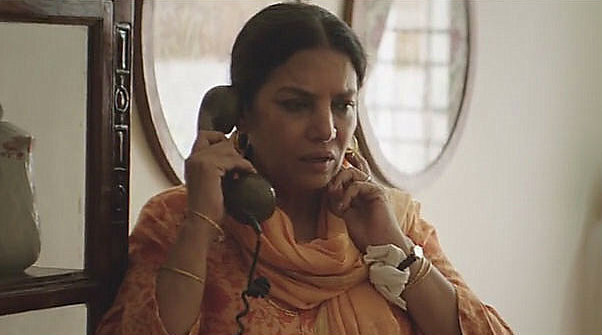 Shabana Azmi is the emotional core of the movie. Azmi is tasked with the most emotionally potent scenes in the movie and yet she delivers them with such finesse that even while her audience is sobbing she manages to smile through tear filled eyes. All credit to dialogue writer Sanyukta Shaikh Chawla that never once does any character deliver a cringe worthy line, even when replaying dialogues from the Rajesh Khanna classic Anand the dialogues land the emotional sucker punch they are intended to. This two women tour de force is ably supported by Yogendra Tikku who plays Neerja’s father, music director Shekhar Ravijani who plays Neerja’s boyfriend Jaideep and the good cop-bad cop terrorists who I unfortunately can’t find names for to give them the credit due. This almost flawless movie is nearly ruined by the schizophrenic camera work at the beginning of the movie, long before the hijack even happens. It makes no sense and it is headache inducing but few minutes into the movie it seems cinematographer Mitesh Mulchandani finally masters the art of a steady shot and it is smooth sailing from there on. Story writer Saiwyn Qadras and Editor Monisha Baldawa deserve special mention for a perfectly paced script that does not miss a beat throughout and a near perfect cut which has no flab or fluff. There is no jingoism in the name of patriotism, there are no larger than life heroes, just a girl who was doing her job and she did it brilliantly. I remember the IC814 hijack but only had anecdotal knowledge of Neerja Bhanot’s story when it was mentioned on news during the Kandahar hijacking but thanks to Ram Madhvani, Sonam Kapoor and Shabana Azmi this is a story I am unlikely to ever forget. What a beautiful and brave soul Neerja was and this story does her memory justice almost 30 years later. The girl who won the highest Indian Galantary award Ashok Chakra, the Tamgha-e-Insaniyat award for incredible human kindness by Pakistan, the flight safety foundation’s Heroism, Special Courage award by DoJ, USA. The Girl who didn’t live Long but Lived it Big. Salute.